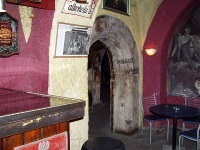 A visit to the Piwnica pod Baranami ('Cellar Under the Rams') - a Parisian-style cabaret house located in Krakow's Old Town district - is probably the shortest route tourists can take to experiencing the culture of the city, and to gaining an appreciation for its most strongly-held values and ideals. The Piwnica pod Baranami was created by Piotr Skrzynecki in 1956, in a suitably bohemian underground cellar, and soon became a haven for local artists and intellectuals; a place for them to meet, exchange ideas, and indulge in one of Poland's favourite cultural pastimes, the political cabaret. The cabaret's reputation grew throughout the latter half of the 20th Century, and soon became a symbol for the eccentricity (and indeed, the stifled talent) of the local artists of the area. The Piwnica pod Baranami still functions as a cabaret house to this day: performances are on Saturdays at 9pm and remain extremely popular, so book your ticket early. This is a highly recommended tourist activity in Poland, and a great place to begin an unforgettable Saturday night out on the town in Krakow. The cellar sometimes closes for a summer break in July - check the official website listed below for more details. Address: Main Market Square, Krakow.